The benefits of going rafting with a commercial outfitter are many, including the fact that they take care of the details such as permits, shuttles, and campsites. However, many boaters opt for the less expensive option of running a private trip on the Merced, choosing to tackle the logistics on their own. 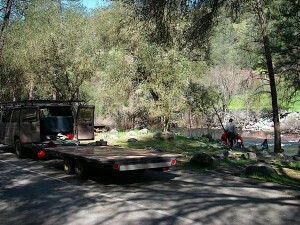 Here is information that will help you put together a private Merced River trip on your own. A permit is not required for private groups to run the Merced River. Just drive to the river and go boating. The Merced is Wild and Scenic and managed by the Sierra National Forest. They have information about fire restrictions and boating regulations. The Merced River is easily rafted or kayaked in one day, but there are camping options along the river below Briceburg Bridge. Camping is mostly accessible by car, so you can go gourmet, have a dry change of clothes in the car, and bring the big family tent. There are no organized shuttle services, but shuttles are easy on the Merced. You can leave a car at any of the put-ins or take-outs. Briceburg is a great meeting spot for either section. This upper section is best run at higher flows, above 1200 cfs. Cranberry Gulch is an alternate put-in for this section about 2 miles downstream. Head east on Hwy 140 towards Yosemite. The Merced River will be on your left the entire way. You can scout several rapids from the road. Cranberry and Red Bud are on your left a few miles before the south entrance to Yosemite National Park. Alternate take-out is Indian Flat. The Briceburg Bridge is on Hwy 140 about 15 miles north of Mariposa. 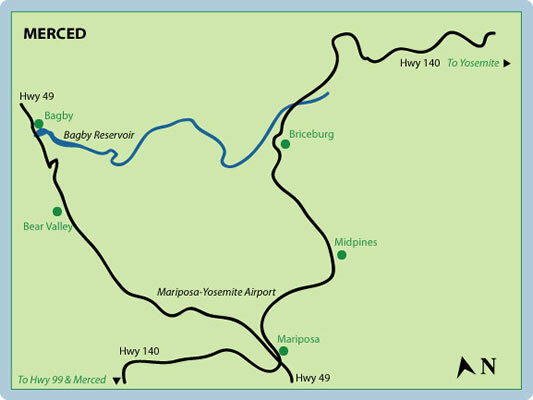 It’s at the elbow in the road where Highway 140 leaves (or gets to, if you’re coming from Mariposa) the Merced River. Bagby, at the east end of McClure Reservoir. From Mariposa, head north on Hwy 49. After about 18 miles, take a right on a dirt road that runs alongside the reservoir.